New book, Darmenzi releases tomorrow, January 17th! Oh dang! It’s the second book release! Darmenzi is finally here, tomorrow! I’m excited, and definitely not just woke up and wanting to get all this stuff said before it’s too night and everybody normal is asleep! 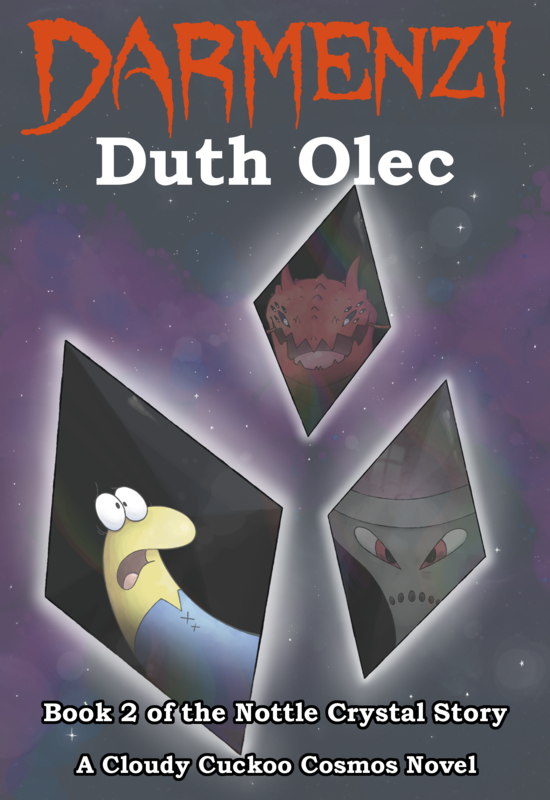 It’s a sequel to my first book, Slubes, which is still available and stars an anxious pile of frayed nerves pulled into an adventure where he tries to prove himself to his love while dealing with his ridiculous world while an intergalactic invader sends destructive, sneaky, and ridiculous enemies to steal a crystal of immense powers. Darmenzi features the return of that anxious pile of frayed nerves, a little braver, a little more confident, still a flopping jitterbug, face off against the authoritative conqueror’s return and a manipulative force of chaos. It has slugs, giant crabs, robots, mechs, magic, caves, ghosts, pirates, ancient ruins, monsters, a dragon, silliness, seriousness, a library, insanity, deep-sea exploration, space exploration, a hotel, a bratty kid with a gun, jail time, a car crash, and sad magma! The final preview chapter is here, and you can see where all three are at the Darmenzi page. The book will be available at Smashwords, and it has been pre-ordable or whatever at Barnes & Noble, iTunes, and Kobo. I hope you like the book! Also, work on a physical copy is under way, I should have more information on that next week. Darmenzi releases Wednesday, January 17th, 2018! In one month! As you can see by the press release I just posted, I finally have a release date set for Darmenzi. It’s been a long time coming… though maybe not as long as Slubes was. The ebook can be seen here and will be $1, just like Slubes, except Slubes is currently free for December on Smashwords. Pre-ordering will be available once Smashwords approves the book and sends it to the websites that allow that; I will keep everyone informed as to when this happens as soon as it does. Keep in mind that if you pledge to my Patreon you get the book upon release, and if you pledge $3 or more you’ll get it BEFORE release! As you may notice, the book has had a bit of a makeover, centering text and making the smaller text easier to read. To go with this is a new book description, which you can see both on the novel page of this website and the Smashwords page for the book. There is also a preview of the final book you can read here, with more chapter previews coming over the next few weeks before the book’s release. Now then. You’ll notice I only mentioned the ebook. A physical book will be coming, but I do not know if it will come on the same day. I’m going to look into different physical book publishers from Createspace, and so that might take a bit of time to settle on one that I’ll want to use (unless the first one I try is great in which case swell!) I’ll keep you up-to-date on that as well. In summary: Darmenzi releases January 17th, preview here, donate on Patreon to get a copy early, physical book news later. Bloomington, IN/The Internet. December 17, 2017—Bloomington and internet author Duth Olec will release his second novel, Darmenzi, on January 17, 2018. A humorous science fiction/fantasy novel with an unusual hero—Numer, ever nervous and timid, consistently flops his way to victory with his friends by his side. Thrust into a role he’s afraid of, allied with a love he can’t work with, Numer challenges The Conqueror, an intergalactic invader, and Darmenzi, a demon who delights in destruction. Slube, in fact, is the name of Numer’s species—you won’t find any humans here! The books take place on the planet Mintop, a world not unlike Earth but filled with a wide variety of colorful alien species, with the squishy, noodly, sluggy slubes just one of many. To go with this variety of species comes a wide variety of colorful characters, with their humorous interactions a highlight of the book. If you’re looking for a human, though, you can turn to the creator himself, Duth Olec, though he be more enigmatic than anyone else—just ask the narrator, Wally Plotch, hired by Duth to record these events into a book. If you ever get lost, don’t worry: Wally is right there lost with you. Raised in Ellettsville and Bloomington, Indiana, Duth Olec now lives in the internet. The housing is a little cramped but the transportation services are excellent. He has been writing stories for thirteen years, and his first novel was published in March 2016. He spends his time making up worlds (like Mintop) and words (like oddtastic). He can be contacted at duth olec at gmail dot com. More writing can be found at https://dutholeccuckooland.wordpress.com/ https://www.smashwords.com/profile/view/DuthOlec https://www.patreon.com/dutholec Slubes and Darmenzi are/will be available on Smashwords, iBooks, Barnes & Noble (US and UK), Scribd, Kobo, Blio, Inktera, and Amazon. Video of Slubes reading and free Slubes ebook! Today marks three months since Slubes was re-released, and to mark this occasion a couple special things. First, the ebook is free until July 10th (and not August 10th, I seriously keep skipping July in my mind, the two months just run together for me, stupid naming convention, no, it is July 10th that the promotion lasts to). Just put in the coupon code LC88G at the Smashwords Slubes page when you get it and it will cost zero pennies. Some three years after the feature was introduced, I made an interview for myself on Smashwords. Because I like talking about myself, but I really like responding about myself, which for the most part is what I did. Only a few questions I typed in myself since they were specifically related to the Duth Olec persona or I thought it would be useful. Eleven questions right now, I dunno what the limit is but I’ll probably just add another each month or a few when an event takes place. See the interview copy and pasted on the blog here! Slubes edition 2 is now available, paperback and ebook! Once upon a time, over six years ago, I started working on an actual novel. A lot of off-and-on work later and the final result is finally final! Slubes is here, for reals this time! The ebook is available at Smashwords here for $1, and the physical book is available on Amazon here for $12. There is also a free preview on Smashwords, should be one coming up on Amazon soon, and I’ll also put up a preview on this website here. In fact, after I type up this blog post I’m going to go through this website and update a lot of pages. Should be fun! I fully believe this book is better in every aspect from the old one, which I suppose is a good thing because anything less would be kind of stupid. It’s bigger, more detailed, stronger, and the author intrusions are more obvious now yaaaay! I’m sitting here thinking of what else to say, but all I can think is that I hope you (the internet) check out the first writing of mine ever on the internet to be finished, refinished, refurbished, reapplied, refibrillated, refinished again, completely finished, recompleted, and made into a readable format! And then I hope, if you do check it out, that you also like it. Like and subscribe! Review it, let me know its strengths and weaknesses, help make the sequel even better (of course, half of that is on this website, but not as finished as Slubes now is). Oh, and I may have Kindle version of Slubes available later this month. That’s all for now.